The so-called Tetragrammaton is composed of the 4 Hebrew consonant letters YOD HE WAW HE and refers to the divine name. It is commonly rendered as Jehovah in the English language, by inserting the 3 vowels "e", "o" and "a" between the consonants. In fact, the Hebrew part of the Bible (also known as the Old Testament) contains the Tetragrammaton more than 6800 times, including some instances inside the Ten Commandments. Moabite Stone from 9th century B.C.E. Lachish Ostracon from late 7th century B.C.E. Dead Sea Scroll from 3rd century B.C.E. The Los Lunas Decalogue inscription uses the Tetragrammaton in 3 places. 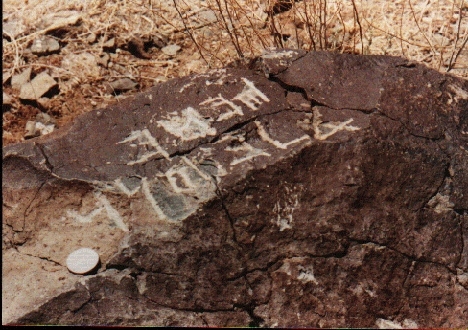 They are carved on the rock surface in old Hebrew letters. And they are probably one of the world's oldest surviving writing samples of the Tetragrammaton! There is another short stone inscription on the south pinacle of the mesa. It may have served as an altar. The picture was taken by David Moore on a field trip to Hidden Mountain in 1993. The first line contains the Tetragrammaton in paleo-Hebrew letters. The letters are similar in style to those on the Decalogue inscription stone but appear to be more eroded.